Defense Officials: Russia Poised to Challenge US for Military Dominance - Integration Through Media ....! (VOA): Russia’s campaign to modernize and strengthen its armed forces is increasingly putting U.S. and European forces at risk, with some defense officials raising concerns Moscow’s military soon could challenge the U.S. and its allies for dominance across the continent. Of equal concern to U.S. and European officials, however, is Russia’s remade conventional military might, which has been displayed and tested in places like Ukraine and Syria. “Russia’s increasingly modernized military is operating at levels not seen since the Cold War,” the commander of U.S. forces in Europe, Gen. Curtis Scaparrotti, told lawmakers in Washington, Thursday, warning the U.S. has no choice but to keep pace. In some areas, like the Arctic, Russian dominance could come even sooner, Scaparrotti said, estimating Moscow could exert control over northern routes there in as little as two to three years. The U.S. and NATO are not alone in their concern. A new report by the Rand Corporation concludes Eastern Europe is especially vulnerable, warning NATO ground forces there would be “badly outnumbered and outgunned” if Moscow were to launch a conventional attack. “Russia would have a substantial time-distance advantage in the initial days and weeks of its ground campaign because of its strong starting position,” the report states. According to the report, while Russia has about 78,000 troops along Europe’s eastern flank, NATO has 32,000. Russian tanks also outnumber NATO tanks 757 to 129. 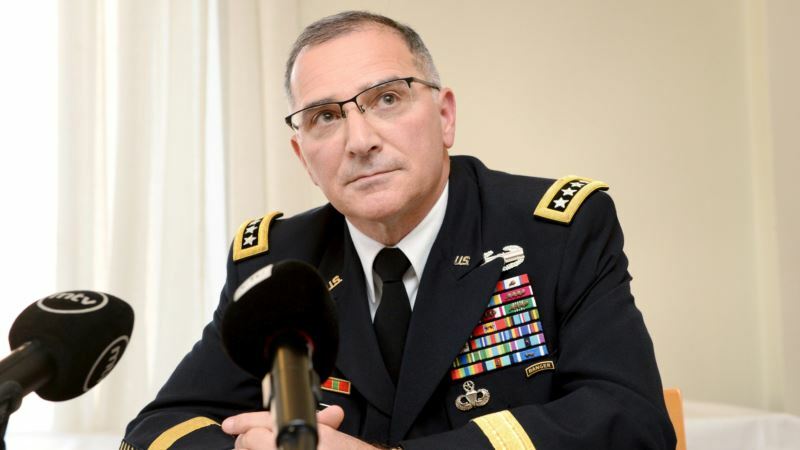 Questioned by members of the Senate Armed Services Committee Thursday, Scaparrotti pushed back against some of those concerns, noting any potential conflict would not be fought with ground forces and tanks alone. There also are some doubts about the likelihood Russia would try to engage in such a conflict. Equally concerning to U.S. and European military and intelligence officials is Russia’s ongoing influence campaign — part of what Scaparrotti describes as Moscow’s “whole of society approach” that can soften up potential targets well in advance of any use of force. The commander of U.S. forces in Europe also expressed concern that Washington may not be doing enough to counter Russia, questioning whether there is “an effective unification across the interagency, with the energy and the focus that we could attain,” despite reinforcing the military’s cyber operations across Europe. “They’re involved in just about every aspect of Europe in one way or the other,” Scaparrotti said, pointing to the Balkans, and Serbia, in southeastern Europe, as a particular area of concern. Russia, which has religious and historical ties to Serbia, has long objected to efforts by other Balkan nations to move closer to the West, including NATO’s acceptance of Montenegro as a full member this past June. Following Russia’s invasion of Ukraine, the U.S. began deploying additional rotational forces to Europe as part as its European Deterrence Initiative. For fiscal 2019, the Pentagon is planning to boost spending on those forces to $6.5 billion, an increase of nearly $2 billion.